Travelling around by Budapest Public Transport is an affordable and easy way to go throughout the city, although most of its tourist attractions are easily reached on foot. On this page you will find the best Budapest travel tips on getting familiar with the city’s public transportation means as well as with taxis, bicycles and boats. 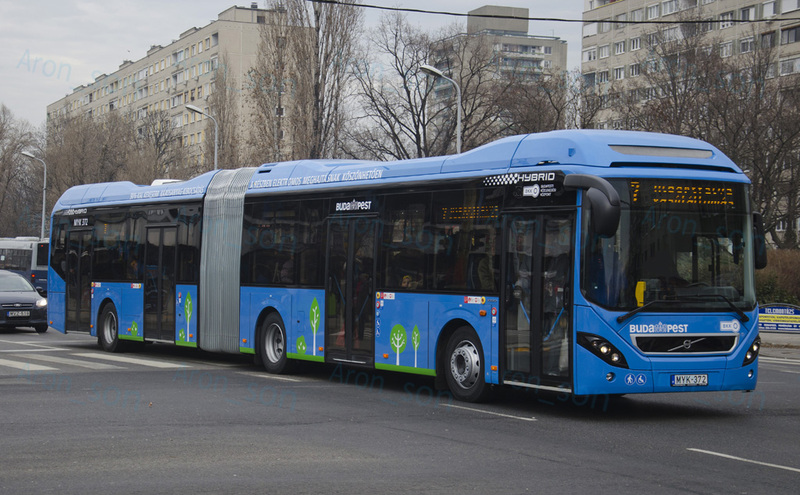 The Budapest transportation network is a well run and efficient service operated by BKV (Hungarian Transportation Company) which consists of a combination of the Budapest metro, tram, buses, trolley buses and the suburban train (HÉV). The network covers the entire metropolitan area and runs from 4:30 am to 11 pm every day. A night bus service operates after hours in the most central areas of the city. You can purchase tickets (the same type of ticket is valid for all forms of public transportation) at metro stations ticket windows (pénztár) and from ticket vending machines. At some stations you can buy them at newspaper kiosks and from ticket inspectors as well. On buses and trolley buses you can also buy tickets on board from the driver, with the exception of night buses and airport bus 200. The price for this ticket is 400 ft. Recently, I discovered that you can buy tickets at the Marriot Hotel’s souvenir shop as well. If you hold single tickets, every time before boarding the Budapest metro, tram, bus, trolley bus or suburban train you need to validate your ticket by inserting it into a punching/stamping machine. This is something you really need to keep in mind; there are no gates neither at the entrance of Budapest metro stations nor on buses, trams, trains or trolley buses, so you are trusted to validate your ticket before starting your ride. At metro stations these validating machines are automatic, orange in colour and are located on the hallways right before the escalators. Insert the ticket in the slot with the arrow pointing down; one quick musical tone will let you know that your ticket has been validated with a date and time stamp on it. On older buses, trolleys trams and trains you will find red small boxes located next the vehicle doors. To validate your ticket, insert it in the black slot and then pull the slot down towards yourself, your ticket will get some perforations on it. One single ticket allows you one uninterrupted journey for up to 60 minutes (110 minutes on night trips) without changing to another type of transport (bus, tram, trolley bus, suburban train). From 2009, if you are travelling by metro and intend to change lines, to validate another ticket is no longer needed. Hopefully with this new rule visitors can get along better with Budapest Public Transport system. If you are using the Suburban train (HÉV) keep in mind that a single standard ticket is valid just within the city boundaries. If you want to travel beyond the city’s boundaries, (for example to Szentendre) you need to buy a separate ticket for the remaining leg of the journey. • Single Ticket (jegy) . It is valid for one way ride for up to 60 minutes without changing to another transport system. Cost: 350 ft.
• 10 single tickets booklet (tíz darabos gyűjtőjegy). It contains 10 single tickets that can be pulled apart and used individually.Same conditions apply as for single tickets. Cost: 3,000 ft.
• One Day Travel Pass (napijegy). It is valid for unlimited number of rides on any type of Budapest public transport (Budapest metro, tram, buses, trolley buses, Suburban train and cogwheel during 24 hours starting at the indicated time and date. It is not necessary to validate this pass but you need to show it to the inspectors upon request. Cost: 1,650 ft.
• Three Day Travel Pass(turistajegy). It is valid for unlimited number of rides on any type of Budapest public transport (Budapest metro, tram, buses, trolley buses, Suburban train and cogwheel during 72 hours starting at the indicated time and date. It is not necessary to validate this pass but you need to show it to the inspectors upon request. Cost: 4,150 ft.
• 7 Day Travel Pass (hetijegy). It is valid for unlimited number of rides on any type of Budapest public transport (Budapest metro, tram, buses, trolley buses, Suburban train and cogwheel during 7 days starting at the indicated time and date. It is not necessary to validate this pass but you need to show it to the inspectors upon request. It is compulsory to write down your name on this travel pass. Your ID or passport might be requested by the inspectors if you are a 7 day Travel Pass holder. Cost: 4,950 ft.
• Family Travel Pass (családi jegy). It costs 2,200 ft and is valid for 1 or 2 adults (18+) traveling together in the same carriage with at least 1 child (up to 7 children) between the ages of 6-14. Children need to carry a valid student card or passport to proof their age upon inspector’s request. This ticket is valid for 48 hours. If you are not really into walking I suggest you buy the 10 single ticket booklet, you will save some money and won’t waste time queuing every time you need a ticket. If you enjoy walking, you will be able to reach most of Budapest attractions on foot, so you won’t really need as many tickets, then in this case it is a better idea to buy single tickets every time you need them. Ticket clerks rarely speak foreign languages, so to avoid any misunderstanding it is a good idea to write down on a piece of paper the kind of ticket you would like to buy and hand it in to the vendor,for example: “1 tíz darabos gyűjtőjegy kérek szépen” (1 ten ticket booklet, please). Keep your ticket at hand at entering the Budapest Metro and for the whole length of the journey, usually ticket inspectors are around and request travelers to show the tickets. Keep in mind that EU residents aged 65 and older are allowed to travel at no charge on public transport in Hungary. Show your valid ID or passport upon inspector request. 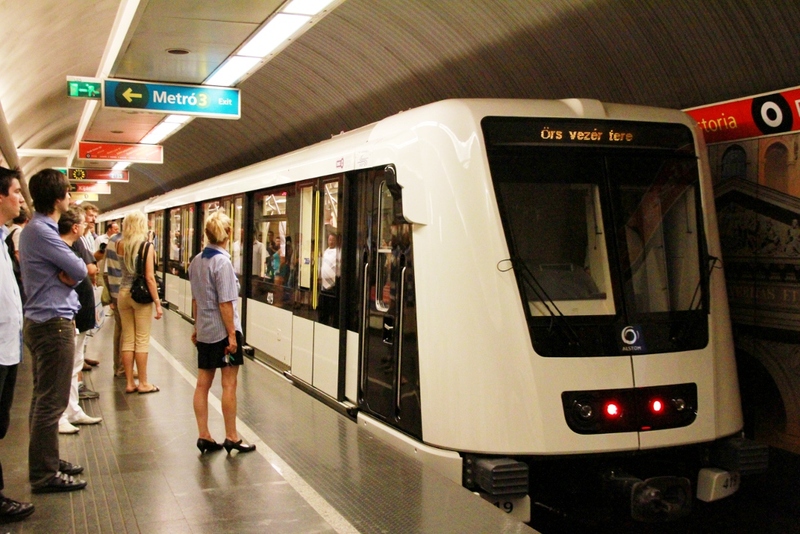 Budapest Metro was the second underground transport network in the world after London’s. It consists of 3 metro lines that intersect only at Deák Tér Station. A fourth metro line is currently under construction. M1 The Yellow line. The Millenium line is a world heritage site, that runs from Vörösmarty tér to Mexikói út and passing under the entire length of Andrassy Avenue up to the Square of Heroes and the City Park. Stations: Vorosmárty tér – Deák Ferenc tér – Bajcsy Zsilinszky út. – Opera – Oktogon – Vörösmarty utca – Kodály Körönd – Bajza ut. – Hősők tere – Szechényi fürdő – Mexikói út. M2 the Red Line. It runs from Déli Train Station (Déli palyaudvar) to Örsz Vezér Tér (East-West). This is the only metro line that connects Buda with Pest and runs under the Danube river. 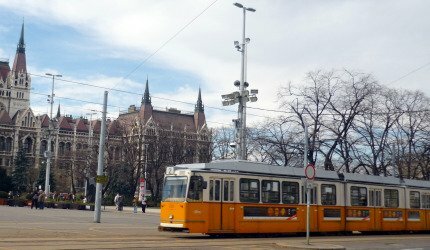 Stations: Déli Palyaudvar – Moszkva tér – Battyhány tér – Kossuth Lajos ter – Deak Ferenc tér – Astoria – Blaha Lujza tér – Keleti Palyáudvar – Stadionok – Pillangó utca – Örs Vezér tere. M3 The Blue Line. It runs from Újpest-Központ to Kőbánya-Kispest (north-south). From the last stop of this line you can catch the airport bus. Stations: Újpest Közpönt – Újpest Városkapu – Gyöngyösi utca – Forgách utca – Árpád Híd -Dózsa György út – Lehel tér -Nyugati Pályaudvar – Arány János utca – Deák Ferenc tér- Ferenciek tere -Kálvin tér – Ferenc Körút – Klinikák – Nagyvárad tér – Népliget – Ecseri út – Pőttyős ut – Határ út – Kőbánya Kispest . M4 The Green Line. It connects Kelenföld Railway Station in Buda to Eastern Railway Station (Keleti Palyáudvar) in Pest. Stations: Kelenföld Train station – Bikás Park – Újbuda Központ – Móricz Zsigmond körtér – Szent Gellért tér – Fővám tér – Kálvin tér – Rákóczi tér – II János Pál pápa tér – Keleti Train Station. Travelling in Budapest by Tram is an easy, convenient and a pleasant way to get to see the city. Budapest trams operate daily from 4:30 am to 11:00 pm, the same way as other means of public transport. There are over thirty tram lines stretching along the city and connecting almost all districts of Budapest. Tram Line 2 runs along the Danube on the Pest side, offers fantastic views of the Buda Castle, the Fishermen Bastion, the Parliament and some of the city’s bridges. It stops at the Chain Bridge, the Parliament, the Central Market, the Danube Promenade and at all points of interest at the Pest side. Tram Lines 4 and 6 run along the Grand Boulevard, a ring around central Pest, that crosses the Danube on Margaret Bridge and Petőfi Bridge. These are the only wheelchair accessible tram lines. Tram Lines 19 and 41 run along the Danube on the Buda side. They connect Battyanyi Square (M2 Red Line) with Gellért Square stopping at Adam Clark Square(Funicular to Buda Castle) and in front of Gellert Hotel where you can get off if you want to pop in Gellért baths or walk up the Gellert hill. Line 19 continues up to Kelenföld Train Station while Line 41 continues to Kamaraerdő Park where it connects to the Suburban railway – HÉV. 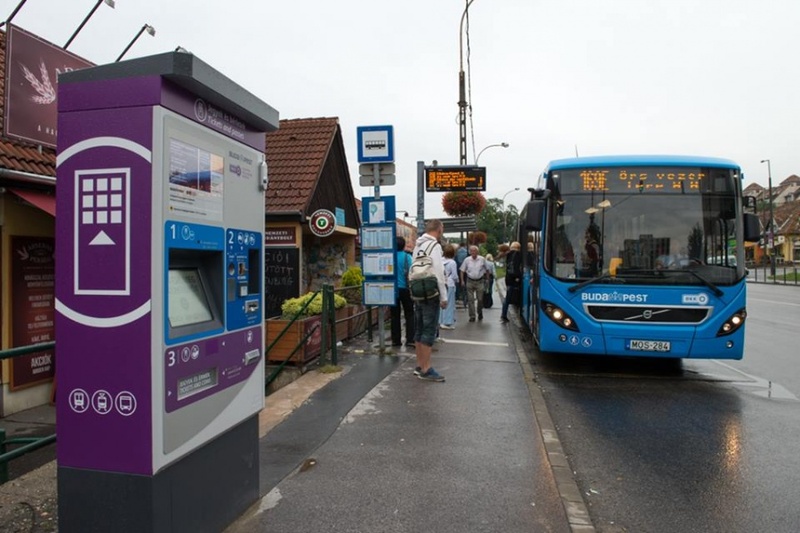 The Budapest bus network is wide and efficient,however during rush hours buses get crowded and roads busy. Budapest blue buses run from 4:30 am to 11:00 pm every day and run along 200 lines that connect all areas of the city. There are 37 lines operating during the night and covering the busiest areas of the city. Line 16. This line goes from Deák tér in Pest to the heights of Buda, where you can visit, among other things, the Buda Castle, Matthias Church, Fishermen’s Bastion and Budapest History Museum. Lines 16A and 116. These lines go from Moszkva Tér to Díz Tér in the Buda Castle. Line 291. This line goes from Nyugati pályaudvar (west rail station) to Zugligeti Libegő (Chair Lift to János Hegy lookout). Line 105 connects Buda with Pest, it takes you from Adam Clark Tér (Chain Bridge) to Deák Tér, travels by Andrassy ut up to Heroes Square and beyond. Lines 7, 7E, 73 and 173E connect Keleti Pályaudvar (Eastern Train Station) with Blaha Lujza Tér where trams number 4 and 6 pass by. Line 200E. It goes from Ferihegy airport to the last blue metro station (Kőbanya-Kispest). During the night this bus is indicated under number 900. Night buses are indicated by line numbers over 900. On night buses you can also buy the ticket on board from the bus driver. A letter E next to a bus line number stands for Express bus. Express buses travel without stops between destinations, or stop just at very few places. A letter A next to a bus line number means that this bus route is shorter than the bus route with a number without the letter A. For example, bus route 16A is shorter than bus route 16. There are over 15 trolley bus lines in Budapest (Pest only). These red buses are numbered from 70, the local legend says that it is because the trolley buses network started functioning on Stalin’s 70th birthday in 1949. 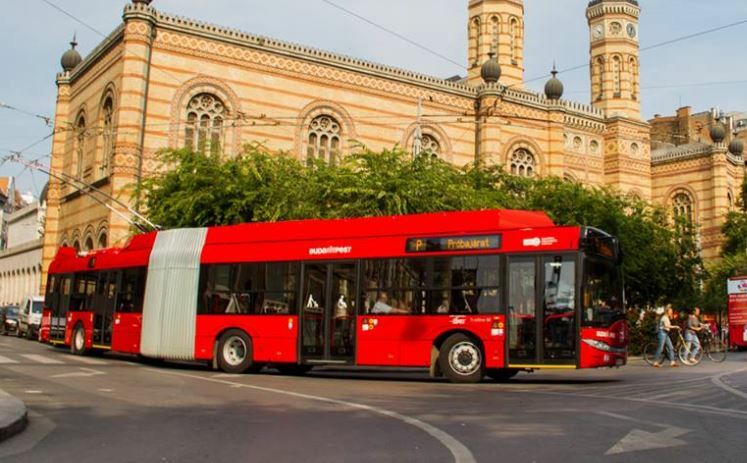 In Budapest, trolley buses are red and are not widely used by tourists, possibly because their routes don’t really run around the tourist areas. However, route number 70 might be useful in some cases. It runs from Kossuth Lajos tér (in front of the Parliament) and passes by Andrassy Avenue and Heroes Square. 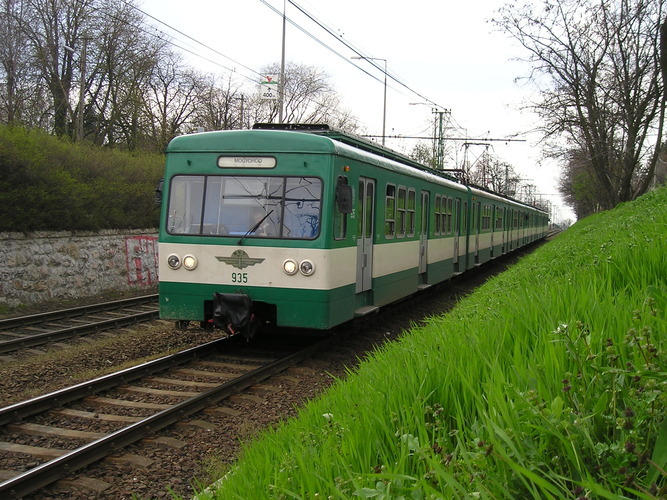 The Suburban Railway is an important transportation mean that connects Budapest with suburban areas and small towns nearby such as Szentendre, Gödöllő, Csepel and Ráckeve. To travel by HÉV you need to use the same type of tickets you use in any other Budapest transportation mean but keep in mind that these tickets are valid just within the city boundaries. During day time, trains for Szentendre leave every 20-30 minutes. If you want to travel to Szentendre, for example, your single ticket is valid only up to Békasmegyer station. So you need to buy a ticket to cover the route Békasmegyer-Szentendre. You can take the train at Battyanyi Tér metro station (Red line). Battyanyi Tér-Szentendre is a popular day trip amongst locals,it takes you through Óbuda and Aquincum. Szentendre is a picturesque town that many tourist visit during their stay in Budapest. Its cobble stone streets, art galleries, restaurants, coffee houses and the Danube promenade make Szentendre a very charming place to spend an afternoon. If you didn’t find what you are looking for, feel free to contact me!